The RF2480 is a high-performance modulator that supports the world's major wireless standards--CDMA, WCDMA, TDMA, GSM and EDGE. This modulator enables base station and handset manufacturers to captitalize on the numerous benefits of direct modulation over dual-conversion transmit architectures. This direct modulator helps set the industry standard with out-of-band noise density as low as -156 dBm/Hz and carrier and sideband suppression of 35 dBc. The RF2480 is a direct quadrature modulator designed specifically to meet 2.5G and 3G base station system requirements. The RF2480 device includes quadrature generation, matched double-balanced mixers, summing amplifiers and RF outputs. 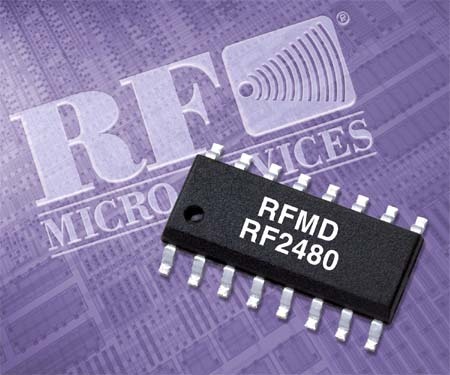 The RF2480 modulator also provides single RF output of 800 to 2500 MHz as well as a highly linear operation and digitally controlled power-down mode. Click here to download the product datasheet in pdf format. Click here to download the RF Micro Devices Infrastructure Product Selection Guide.